1) 4MB back-up ram for game data saves, settings, and rankings. 2) 4MB ram expansion for games that require 1M or 4M ram such as Vampire Saviour, KOF96, etc. 3) All territory converter. Play any and all USA, JPN, and EUR Saturn games. 4) Pro-Action Replay cheat code function for hustlers and cheaters. Please note that this product listing is for the latest update from EMS and the 3 in 1 Action Replay 4M plus no longer features the Comm Link connector. 1) Can I play King of Fighters 95 for the Saturn with an AR4M? No, KOF 95 requires a proprietary ROM cartridge which was bundled with the game. 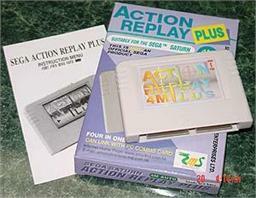 If you purchased the game from EBAY or another used game source, you should have received the ROM cartridge as well. 2) Are the AR4Ms that you sell new? Yes, the photo shown on our shop listing is for illustrative purposes only. When you purchase an AR4M, you won't receive the exact AR4M that is shown in the photo. We have plenty of them in stock and they are packaged in their original purple factory containers. 3) I'm having a problem with my AR4M. HELP! A clean connection between the AR4M and the Saturn is very important for the cartridge to work properly. If you encounter glitches, remove the AR4M, clean your cartridge port and reseat the AR4M. That should fix 99.99% of most AR4M issues. 4) What games can I play with the AR4M? -- USA/EUR/JPN Saturn console owners will be able to play USA, Japanese and European games. -- Games that require 1M and 4M ram expansion may be played with the AR4M. Some examples are Vampire Saviour and Dungeons & Dragons Collection. 5) When I copy save-data to the AR4M, it doesn't stay saved. Why? Please note that after copying save-data from the Saturn's system memory to the Action Replay, you must press the "B" button on the control pad to exit and write the data to the card. If you simply power off the Saturn without pressing the "B" button first, the data is erased. 6) Do the AR4Ms that you sell have the COMM port on top? No, the latest revision of the AR4M from EMS no longer features the COMM connector on the top of the unit. 8) Does your AR4M play all 4M games? Yes, we're selling the latest batch which have been wired properly to access all 4M of ram on the AR4M. This document is ©NCSX 2003. All rights reserved. No reproduction in whole or in part of this document may be made without express written consent of National Console Support, Inc.